Over $10 mln have been invested by the Party of Regions into American politics. This amount was paid for the services of lobbying firms in Washington by the Yanukovch associates. Money were transferred through the mediation of a questionable firm in Brussels. 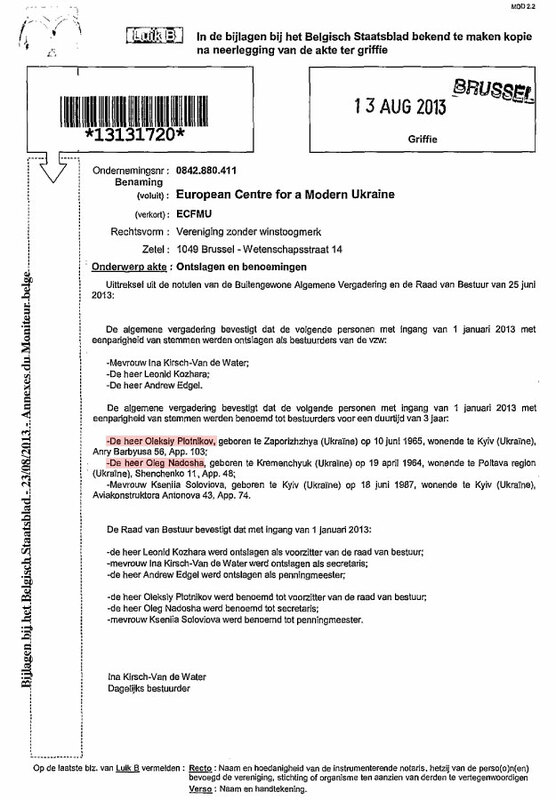 Almost two years ago an organization called “European Centre for a Modern Ukraine” was established in Brussels. It was conceived as a vehicle to promote Ukraine to European institutions. But it actually turned to be a washing machine for the Party of Regions, meant to wash their reputation in the West using funds of obscure origin. The founders of the “European Centre for a Modern Ukraine” were at that time three Members of the Parliament from the Party of Regions, who in two years since have moved considerably up the power ladder — the current Foreign Minister Leonid Kozhara, the current head of the Budget Committee of the Parliament Ievgenii Hiellier and the current head of the Foreign Affairs Committee of the Verkhovna Rada Vitali Kalyushnyy. Headed the Centre a lady from Germany called Ina Kirsch Van de Vater, who along with two other European citizens also was among the founders. A member of the Party of Regions Kalyushyy has been appointed a Treasurer of the Centre, despite the fact that MPs are prohibited by law from holding leadership positions in any institutions. “Ukrainska Pravda” has the statutory papers confirming the violation of the law by the Member of the Parliament. When an article about involvement of Kozhara, Heller and Kalyuzhniy and about the work of the latter in Belgian firm while holding a representative mandate, the Regions made a substitution. Acting Members of the Parliament were substituted with former MPs from the party in power. The surnames of Kozhara, Hiellier and Kalyushnyy have been taken out from the registry, instead former MP Oleg Nadosha, another ex-MP Oleksiy Plotnikov and Kseniya Solovyova born in 1987, a lady unknown to us joined the list of founders. The documents confirming that are also in our possession. All mentioned MPs belong to the so-called “Kliuiev group.” The cover story for the “European Centre for a Modern Ukraine” is to prepare newsletters for Western audiences promoting the party line of the Regions. 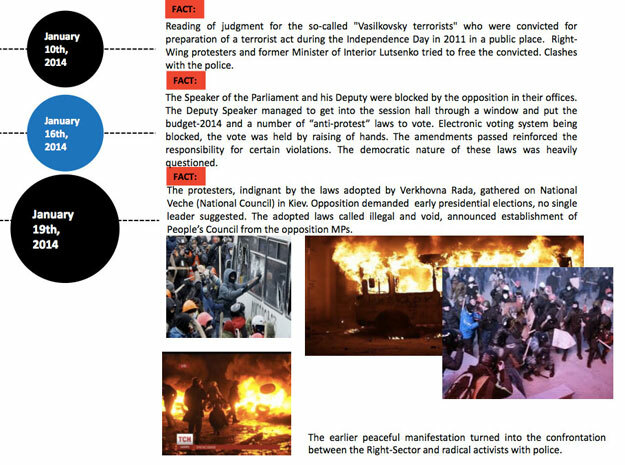 Moreover, to avoid being suspected of relation to the power party in Ukraine, the version of events is laid out carefully, betraying the real agenda only through avoidance of certain facts. For example, here is a slide of the most recent presentation of the center. It describes the events during the voting for the dictatorial laws on January 16. The bulletin for Western audiences begins by saying that the Speaker and his deputy were blocked by the opposition in their offices (without explanation why). “Vice-Chairman climbed through the window to enter the chamber, and put to the vote the budget and a series of “anti-protest” laws (laws actually introduced dictatorship and reach far beyond protest curbs — UP). The legislation strengthened the punishment for certain violations. Democratic nature of these laws was much doubt”— that’s all. Then it says that the opposition has demanded early elections, but hasn’t put forward a united candidate — though any candidates would be irrelevant since the election has not been called anyway. Similar distortion fills all produce generated by the said Center. However, preparation of informational handouts is only the tip of the iceberg. 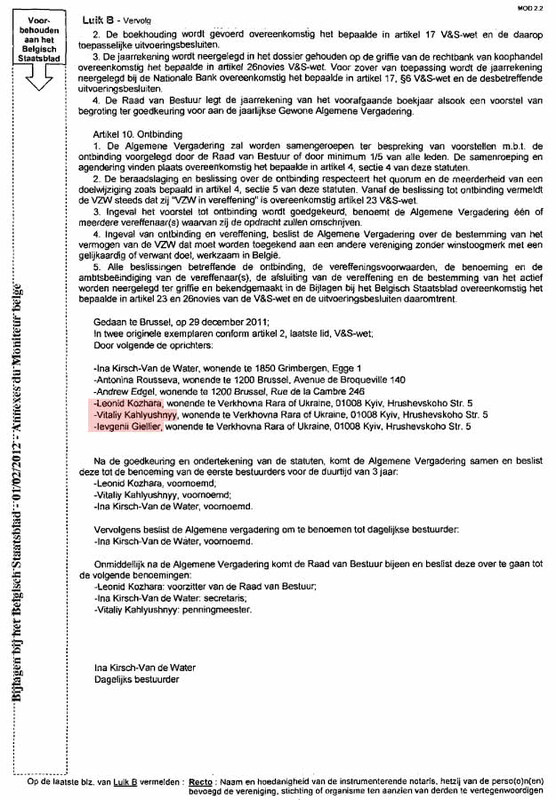 It seems that the main purpose of institution in Brussels is hiring lobbyists and PR specialists for the Regions promotion, and pumping of funds for these services from politicians with dubious reputation to respectable western companies. For example, the budget of “European Centre for Modern Ukraine” reported on the site of European Commission is only … €10,000. At the same time in 2013 they have paid American lobbyists 50 (!) times that sum — $720,000. In 2012, the Belgian mediator paid the Americans even greater amount — $800,000. In total for two years — more than $1.5 million! All relevant information is available on the official site of the U.S. Senate. Thus, “European Centre for Modern Ukraine” has contracted two lobbying firms. The first – the Podesta Group, founded by brothers Tony and John Podesta. Former headed the office of President Bill Clinton in 1998-2001 and is a senior adviser to President Obama since December 2013. In two years Podesta Group received $1.2 million from the Centre. Here is a report of the Podesta Group to the Senate about receiving from Brussels middlemen $120,000 during the fourth quarter of 2013. The second company that hired “European Centre for Modern Ukraine” is called Mercury/Clark & Weinstock, affiliated with an ex-Republican congressman John Vincent “Vin” Weber, who has been involved in the last presidential election campaign of Mitt Romney. This company has received $500,000 from Brussels during two years. Where did a Brussels firm with a budget of 10 thousand euro has money to pay astronomical sums to Washington? “Ukrainska Pravda” has addressed the question to the chairman Mrs. Inna Kirsch but did not get a straight answer. “The Center is funded by donations from individuals and private companies. Some of these sponsors have committed to funding the activities of PR firms in support of the Center”. Mrs. Kirsch declined to reveal the names of these people. And now — for the most interesting. So apparently the story that America is unimportant for the ruling elite of Ukraine is a myth. Last year Sergey Kliuev, a member of the Party of Regions and the brother of the current head of Administration of President, won himself the post of the Chairman of the parliamentary group for co-operation between the Verkhovna Rada and the U.S. Congress. He snatched it despite already being the head of a similar “friendship group” with China. Kliuiev managed to achieve that through the Foreign Relations Committee, headed by aforementioned Vitaly Kalyuzhniy. Also last year Kliuev twice visited Washington — in May and June. During his meetings in the U.S. capital Kliuiev was accompanied by Ed Kutler, the head of lobbying firm Mercury/Clark & Weinstock. “Ukrainska Pravda” asked Mr. Kutler in which capacity he was present together with Kliuiev. He did not deny these contacts, forwarding the questions to the “European Centre for Modern Ukraine”. “We work for them,” – said Kutler. Based on his words it’s apparent that the Brussels firm not only is a money transfer mediator for the Regions in America, but also provides Kliuiev with help from lobbyists in Washington. One more thing. Ina Kirsch claimed that the Centre has no relation to the Kliuiev’s fund. But she forgot to mention that her husband Robert Van de Vater has recently become… a Deputy Board Chairman of Kliuiev’s fund. 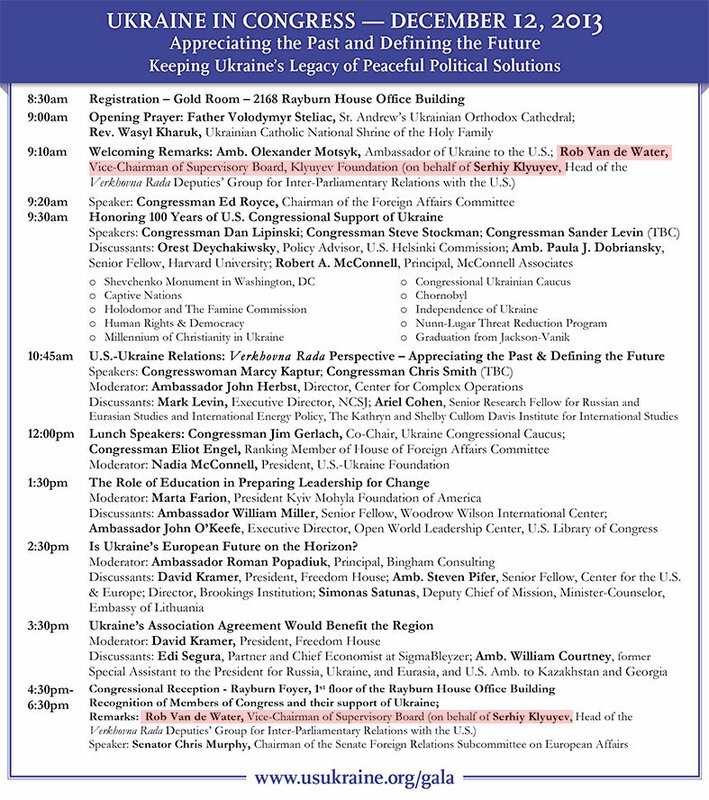 In such capacity Van de Vater acted in December 2013 at a conference in Ukraine matters, held in Washington (click to enlarge). Thus emerges a rather blunt picture. The money of unknown origin — but obviously involved in the corrupted and anti-democratic regime of Ukraine — transiting through the Belgian structure, again affiliated to Yanukovych — is pouring into American politics in exchange for the lobbying services to clean the reputation of the said odious regime. It is rather concerning decision of the Regions investing the money earned for them by the people from Eastern Ukraine not in social projects for their electorate, but into the bedevilled Americans. Although they always find an intricate explanation for this sort of things, whilst enriching themselves at the expense of the state and heavily encrusting the voters’ ears with political spaghetti. 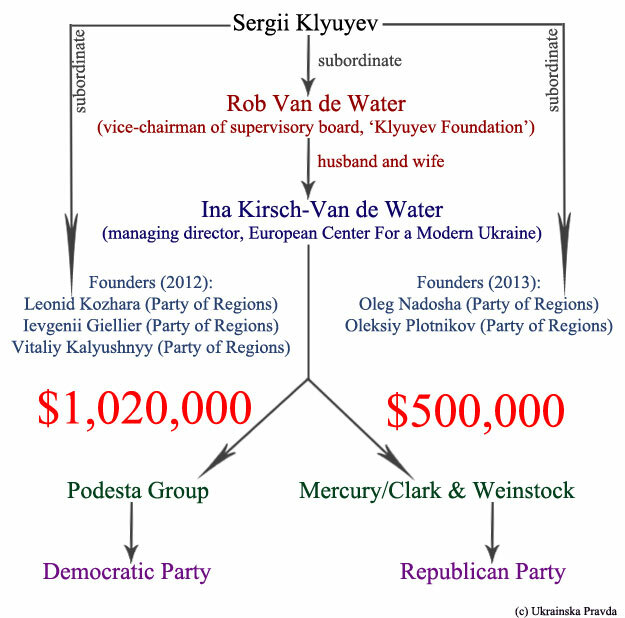 This entry was posted in English News, News and tagged Belgian firm, Ed Kutler, election campaign of Mitt Romney, European Centre for Modern Ukraine, Kliuiev group, lobbyists, lobbyists in Washington, Mercury/Clark & Weinstock, Party of Regions, Podesta Group, Sergey Kliuev, USA, Van de Vater, washing machine, Yanukovich money, Yanukovich regime. Bookmark the permalink.